3. Waste-free Lunch - Tuesday April 22: The idea of Monday's waste-free lunch is to have a day when we produce no garbage. Please send your child's lunch in a reusable container, and there should be no disposable wrapping inside at all. That is the goal - nothing that will be thrown away. Here is a link to a website that might give some ideas. Shady will also be sending over only reusable materials with the food for his lunches on Tuesday, too. 10. Final Parent Workshop - Resiliency: Pam Pelliccia, our elementary counselor will present a workshop entitled; Building Resilience in Your Child on Tuesday, April 29th from 8:30 am-9:30 am in the Conference Room (2nd floor of the Administration building). The mindset of resiliency is the ability to recover from setbacks; the quality of bouncing back. Resilient people see challenges as opportunities. The workshop will combine information sharing and group discussion to identify strategies to teach your child resiliency. Please do come along - there will be coffee!! 11. Elementary School Summer Camp: There will be a note heading home on Wednesday next week to find out the interest level for an Elementary School Summer Camp. If there is enough interest, this will run from 9:00am - 3:00pm on June 16-20. 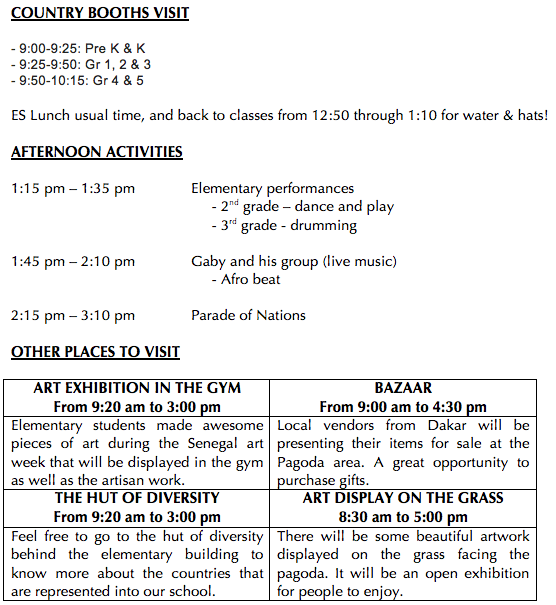 This is only for Pre-K - Gr 5 students who are currently attending ISD. For those new to the school, we ran the same day camp last year which was also coordinated by Ms. Bockarie. There is a lot more information on the flier which will be sent next week. 12. Art Salon: Mark in your diaries the 2nd Annual Art Salon, where all of our K-5 art through the school will be on display after school on April 30 from 5:30-7:15. More on that next week.